What’s so special about 14 days? Hi David, I am a language learner and am impressed with your Goldlist system. I want to ask you a question about the Goldlist method if that’s ok. Why did you choose 2 weeks as the minimum period for the first distillation? Was it efficiency/management of growing bronze lists that decided this period of time as I can’t find info on the association between 2 weeks and the end of short term memory? I understand the 20-30% retention by this passed time but I just want to check with you. Also, it occurred to me that one could activate this first 20-30% after only 2 weeks rather than waiting to be finished all distillations. By activating, I mean using a full circle method like Luca Lampariello to translate the known passive sentences back into the target language. I think this does not contradict the long term memory goal as you are only activating known words. Looking forward to hearing your thoughts. Fintan. Can I write the answer as an article on huliganov.tv? Now and again in my writings (which anybody could be forgiven for not having read all of), I have spoken a few times about what the significance of the two week fermentation period in Goldlisting is. However, I don’t think I’ve really said enough about it and so this question is a very useful one for those who would also like to know more about the topic and many readers no doubt will be interested in delving into this particular issue more closely just as Fintan is. As you know, the Goldlist method is based upon the findings of Ebbinghaus, known as the father of the study of memory as well as the father of clinical psychology. Very little prior to Ebbinghaus’ work had been done on the human mind and memory using the scientific method, namely experimentation and the testing of various theories by performing logical experiments giving tangible evidence which can be repeated by other people. Ebbinghaus was groundbreaking because he did this for the first time in a very imaginative way – and in a way very interesting for polyglots. That is to say he taught himself nonsense words and measured how quickly he would forget them. One weakness about his method was that he used himself as the main subject, being too kind to inflict the rigours of learning nonsense for the pure sake of forgetting them while measuring the rate of doing so on his students. If you want to know more about this pioneering scientist, a good place to start would be the Wikipedia articles on him and on his theories. Reading them however you will probably notice that two weeks per se is not mentioned. And neither is the idea of there being a short-term memory which is for conscious and long-term memory which is for unconscious learning. You can look for these concepts in the work of Ebbinghaus in the way that you could look for the term Trinity in the Bible, or indeed the name of God in the book of Esther. These are things which are intrinsic, and go without saying to a degree. It is not possible to understand all the observations of fact without such a theory, and therefore it emerges from the work even if not explicitlt mentioned. Of course, it is also possible that I’ve read into what Ebbinghaus did more than he ever intended, and if that is the case then of course on the one hand that would put me in a position of being less “scientific” than such methods as Supermemo by Wozniak or Anki which certainly do map onto the forgetting curve in a way which the Goldlist method does not, but for reasons I’m going to come to an moment that actually doesn’t matter. Let me just grab a picture of the forgetting curve if I can. Bear with me one moment. Right, here we go. Thanks to http://en.wikipedia.org/wiki/User:Icez for this, which he placed into the public domain. As you will see, it is not that you remember everything well for two weeks and then get a sudden deterioration. Not according to this, anyway, and not according to the raw data Ebbinghaus made from his experiments with himself. There are reasons that I will go into a little bit later on in this article that make me think that such phenomenon does exist. However I don’t know of any actual scientific evidence proving the observation is measurably true rather than simply anecdotal but I will give you all the reasons why I think that the two-week cut-off is more than just an arbitrary point in the forgetting curve. That’s coming up below in the article. However first let’s treat it as a point in the forgetting curve, an arbitrary point. If we look along each of those lines in this graph we will see that they all start to flatten out quite a lot by the end of this graph at day six. Clearly time doesn’t end at the end of day six, but goes on. Those lines which are not flat at the end of day six start to become flat later so that by the time we get to the end of two weeks, you will see if you carry on these lines with your own hand by rewriting the graph on a page that the end of two weeks gives you a very good chance for all of these lines to have flattened out. The one of those lines which most resembles language learning seems to be the third one along. Usually Ebbinghaus was able to learn about 30% of his material without forgetting it on each sitting, which is about what that line equates to. The more you try and do in a Goldlist book, i.e. the more information you put on a line item at the head list stage (although not necessarily at later stages because of the long term memory power of combining things) the harder it would be to achieve a 30% result. You need to keep your Headlist fairly loose. So if you’ve rewritten the graph as I suggested and you’ve extended it for a few more weeks if you make a line at the point which represents 14 days you will see that if you draw a straight line between the beginning of the graph and the line at that point it will have a much steeper gradient than one that you could plot between 14 days and say several years. You can make an approximation to the point at which things are really learned for the long-term by placing an arbitrary cut-off at the 14 day point. When it comes to asking is there really a long and short-term memory which are conscious and unconscious I think that really rather than going into any scientific experiments you simply have to look at you own experience and see how many things there are that you never made an effort to remember that you still remember for the whole of life – including, significantly, your successful acquisition of your first language, and compare that to memory tasks you failed to achieve to the long-term memory regardless of effort and indeed success in learning them for regurgitation to a shorter deadline. I don’t know of any experiments which really prove or disprove this idea, all I know is that these things have now been discussed by me in person than online by hundreds of people, people tend to be reasonably self-aware of their learning process, and unless anyone has a particular axe to grind they tend to agree with the idea and therefore it seems to be something which resonates with the majority of people, and let’s just say – unscientifically of course – that therefore it is likely to be true. If that sounds lame, let me just defend myself by saying I don’t have enough money to conduct scientific experiments on the matter. I would be very happy to give my ideas to any academic team that wants to conduct such experiments, I’ll be very happy to hear of any such experiments, and I’ll be very happy if some of my taxes went towards the funding of such experiments. Don’t ask me to fund them, though, not unless I’ve won the lottery first. If anybody wants to try and do this using crowdsourcing, again I’m happy to co-operate. Unfortunately I don’t really have the time to initiate it. The first people in my life who made the observation about two weeks were actually very observant teachers, talking about what to do in the run-up to examinations. They stated that the last two weeks was the time for cramming, and cramming done before that wouldn’t work, but that a lot of success could be achieved by cramming in those last two weeks. Obviously that made me think. I’ve noticed by the way that it’s quite popular in United Kingdom schools these days to have a two-week lesson cycle, whereas when I was at school we always seem to work on a one-week lesson cycle. I suppose that this is a result of the observations of teachers about learning filtering through into general practice in the construction of the school lesson plan. the next observation I made is that you will see quite a number of courses (the Daniels courses and the Callan courses have done this, among others) offer a refund if you are not completely satisfied and that this only lasts for 14-16 days. I have worked in various tax regimes and can’t see a fiscal reason why this kind of period would be taken as the actual cut-off – again it all seems rather arbitrary. In the absence of a fiscal reason, one looks for a psychological reason. Or possibly more than one psychological reason. If they simply said two weeks that might not seem as long as 16 days when you’re looking at the pack in the shop. The two days’ difference between 14 days in 16 days is not all that big, not usually long enough for people to register the what was going on over the first 14 days is not really going on in their heads any longer. The fact is of course that you plateau out not immediately at 14 days, but at 14 days you start to plateau out. The fallout from language courses happens more in the fourth or fifth week after the initial disillusionment has set in in the previous week when the learner has sensed his plateauing out. Short term memory-based courses create wonderful effects in the first two weeks, much better than long-term memory courses, but it is all illusionary because this will disappear. But their business model is based on making the student believe that they have failed so that they come back again in the future. That is why there are so many language schools teaching English in most every street corner around Eastern Europe and beyond. A very small percentage of their students obtain anything like normal value for money from their services, but for the first two weeks they will appear to do so. Hence the companies boldly proclaim that the 16 days they have a money back guarantee. This can be observed again and again, it’s still going on. Maybe it takes an auditor to sit and think about why exactly that is the case, maybe not, but at any rate I did so and maybe I would have not had the critical apparatus to dissect the socio-economics of this without a training in audit, which I thoroughly recommend by the way to people whose overall aim in life is to gain an understanding of how human life works. The third and final reason needs me to write at great length and so I will go back to the main margin. When we look at the way this world is ordered we see that certain things work in multiples of seven. We know that we have a seven day week for example, and we know that this seven-day week is the basic standard worldwide. There have been other standards, and there have been attempts to resist the seven-day standard – both by Napoleon Bonaparte and by the Russian revolutionaries. Both of these groups considered that enlightened humanity ought not to be bound to a week length dictated by Judaeo-Christian literature, and therefore they attempted different week lengths. However in all cases these experiments were doomed to failure. We are simply constructed by our Creator around the idea of a seven-day week. The Bible – culminating in the New Testament and this particular doctrine in the Book of Hebrews (I won’t say where as I want you to read the whole Epistle) – explains what the idea of the Sabbath is and why it was instituted from the beginning and applies to all nations, not merely Jews. Some secular observers say that this is all linked into the fact that the cycle of the moon is a four week period. Certainly we cannot really deny that the menstrual cycle of human females is linked to this – its very name suggests it. Because of the way we live now, this is not always a lunar month of 29.53 days, but can be from 21 to 35 days depending on the woman concerned. Those who are women reading this will know this but I am writing this for the men, especially those who have not taken that much of an interest because it is not their headache, if you’ll pardon the pun. Nevertheless, even in today’s world, you can notice that where women work closely together in a room where they are exposed to each other’s chemicals the whole time, where men are not present and where there is less masking of natural scents with the modern standards of hygiene, in these places even till today communities of women start to subtly adapt their menstrual cycles so that they all begin in the course of three or four months to ovulate and menstruate roughly together. This is called the McClintock Effect but is not considered entirely scientific because the experiments done by Martha McClintock have not always been successfully replicated. My suggestion is that the subjects of the later experiments had been using more modern hygiene standards and the ones initially done in the 1960s when it was acceptable to pong a bit more than people do these days. Anyway I don’t want to divert too far down this line as you might already be thinking more what has this got to do with 14 days and the cut-off between voluntary short-term memory. The fact is that this cut-off date if it exists and is true and that there is some real deterioration of short-term memory after 14 days, then the reason for this being there is all linked in to the above. Because it all comes from the hunting cycle which human beings basically lived by in the earlier thousands of years (evolutionists make that hundreds of thousands of years) of our existence. Whether I like it or not the majority of people seem to believe in evolution to one degree or another, and so I’m been put the answer in evolutionary terms. This is the sort of fairytale that you would normally see in the books of Richard Dawkins, that marvellous rhetorician who knows a thing or two about zoology too, but never mind. As with all fairytales, you will easily see the grain of truth in it and if it makes people think then it has done its job. You see early people, when people were first conscious of who they are, they began to eat meat. At sometime in the past people probably did not eat meat – most of the so-called great apes don’t eat meat, and the development of meat-eating among certain tribes of chimpanzees has advanced certain steps even within observable time. Human beings became hunters, they were what is known as hunter gatherers, and we do know from archaeological excavations what kind of prey they liked. There is no shortage of sources on the Internet that you can search for that show that in the territory that is now Israel, archaeologists have discovered the extent to which human beings, for many thousands of years of the development, relied very strongly on the meat bones and hides of elephants. In the fertile crescent, elephants were the favourite food of human beings, there are reasons to believe that there were many many spaces of elephants most of which were hunted to extinction, including the Northern Mammoth which is genetically different from African and Indian elephants that we have today much less than previously thought according to modern DNA research. This DNA research in turn shows that the placing of Indian and African elephants into two separate genera (Elephas and Loxodonta) was probably fallacious. Opinion is divided on the role of human beings in the extinction of various larger mammals which are known to have been used as their sources of food, certainly the question remains as to why various elephant species were eradicated totally in certain parts of the world but managed to survive in others. I would anticipate that the answer to this question is based on the cult of the elephant in some cases – where people decided that they preferred worshipping them to killing them, and in other cases the elephant was simply able to survive in conditions which were too severe for human beings. Hence you have elephant populations surviving in Africa in tough conditions and in Asia where their cult is stationed, and has been probably for longer than we tend to give credit to. Now when you go off in a hunting party to kill a mammoth or another kind of pachyderm, you will soon realise that you need a strategic advantage, or indeed several. Elephants are the only creatures with a language even approaching that of human beings. The work on the dictionary of elephant language is far ahead of similar work done for whale song or ape calls. (For more on this, Google “Andrea Turkalo”). Moreover elephants are able to communicate to each other even when miles apart because of the power of their particular vocalisations to pass through the air or through ground. Usually when an elephant listens it doesn’t only stick out its ears, it also places one of its feet into a particular position were sensitive part of the foot is touching the ground lightly, and the overall auditory function seems to be shared between the ears and the feet. They are capable of letting each other know where the enemy is coming from, and also to gang together and to make a concerted effort to repel the enemy. They are incredibly strong, unlike horses entirely merciless hence their superiority over horses in ancient warfare and torture methods, and prior to the advent of modern weaponry the only way to kill them would have been by an orchestrated attack by the number of men. They on the other side are perfectly capable also of orchestrating joint attacks on men. One of the ways in which we conducted our warfare against the species was to increase our linguistic abilities. An article in Ha’aretz suggests that it was only after elephants became extinct in the Middle East that the human being started to need to develop into modern humans with larger brains, but I find the whole line of argumentation specious even when for the sake of playing devil’s advocate I’m willing to think as I would if I believed in the theory of evolution. Surely it would have been over the course of our warfare with elephants and not when moving on to eat the easier but less desirable prey left over after elephants were extinct that we developed many of our advanced facilities such as the bigger brain associated with Cro-Magnon man, as early Homo sapiens have been called? Everybody knows that it is during conflict and war with a worthy adversary that advances are made, and not when people mess about with smaller matters. To counteract the elephants’ increasing knowledge of language we had to develop our language. They were doing the same. They developed a hige range of vocalisations we cannot even hear. They even developed a sense of death and arranged “elephants graveyards” to die in – the closest thing any beast has to religious observance. So in addition to the language war, we needed to leverage other strategic advantages in order to beat and eat our pachyderm prey. As is known elephants are highly mobile animals, some species were even migratory. Their territory extends over a huge range and they don’t tend to forget any aspects of their geography. There is a saying about elephants that they never forget, and indeed just about any animal but man is devoid of conscious short-term memory, and is only equipped with the unconscious long-term memory. This is why you will not find animals forgetting tricks that you have taught them. They may become physically less capable of jumping over hurdles or performing other sports or party pieces that they may have been trained to do in the past, but you never find that they have simply forgotten them. This is a human trait not an animal trait. Early man also would have had only an unconscious long-term memory. In order to follow elephants over their huge territories which varied every time, mankind would have needed to develop the ability to agree amongst themselves that they would remember this particular landmark, to turn left at this rock to turn right at that stump. Then returning from their long long expedition with hopefully the carcass of one or more dead elephants, they would find their way home. But we have several good reasons to expect that the elephant hunting cycle was a lunar hunting cycle. The first reason for this is that the vision of the elephant differs from human vision. In broad daylight humans and elephants both see everything that they need to see. In that case, it becomes difficult to trap the elephant, and the elephant in turn is able to use its great strengths to massacre the hunting party. Obviously people didn’t want that. So what about night? Well the problem with night is that elephants do have the ability to see at night, whereas we don’t really have the ability to see at night very well. So dark nights are the times when the hunting party really gets massacred if it comes across elephants. And people didn’t want that either. However there is a kind of light where people can see well enough to avoid the elephants’ attacks while the elephant itself isn’t seeing at its best and therefore does fall into the trap. This kind of light is what we have at the full moon. Indeed, human beings have legends about what happens at the full moon with men turning into wolves and things like that, probably these are cultural memories of the peak hunting moment against the elephant. And so we can easily envisage early human tribes running their elephant-based economy on the basis of this lunar cycle, and for what evolutionists would turn as hundreds of thousands of years we have the male group leaving the females and the children, going off to locate where the elephants are since one month had passed, this involving the use of developing tracking skills, being able to discuss and compare things between themselves, therefore linguistic skills, being able to plan traps and attacks on elephants, again needing the honing of language, and needing to remember the route back home again after a possible seven day march. So you have seven days in which the hunting party locates the herd of elephants, they then wait for the full moon, hunt them over those nights, and then make their way back again. This takes two weeks, and we know it takes two weeks because two weeks is the period for which the human female is uniquely infertile within her menstrual cycle. Again, bonoboes, considered to be our closest relatives, are infertile only 25% of their cycle. Surely there is a reason why, and this could well be that the female humans were unprotected during the time when the males are away, and other males could come and have their wicked ways with the females were particular tribe, but the males would not want to protect the children if they looked different to them. So the safest thing was to be infertile when their own males were away. And so to this day, human females are generally speaking not fertile the seven days before and seven days after the first day of their period. No other animal has this feature. It’s the same two-week period and it’s the hunting cycle which causes things together. The same two week hunting cycle effect that keeps females from being impregnated when the males are away also determines what lengths of time these people needed to remember their landmarks in order to get home. We hunted elephants this way the majority of time in which believers in Evolution would say we were human. So that is why we developed a short-term memory and started to learn consciously and with intent, that is why we developed a faculty for being able to forget consciously learned material (it would just confuse us the next time in a different place with a similar tree) that is why we have language and that is why we have a lunar menstrual cycle and that is why we are talking about 14 days as the most reasoned cut-off, rather than 20 days or 10. That is, if you believe the above fairy tale about man’s past. The alternative is just to believe in Creation rather than Evolution, in which case the reason for 14 days is easy – it is two weeks and God made the week to have seven days as it says in Genesis. One way or another, the 14 days is reasoned, whether you are an Evolutionist or a Creationist. Why it is that these language schools use the period is a mystery unless they have thought it through about the elephants, but in their case it is more likely to be based on their own commercial experience and the immutable law that trial and error will get you there in the end. I hope you found that to be an interesting and at least partly convincing answer to your question. In the end the 14 days seems to work, because the Goldlist method seems to work. 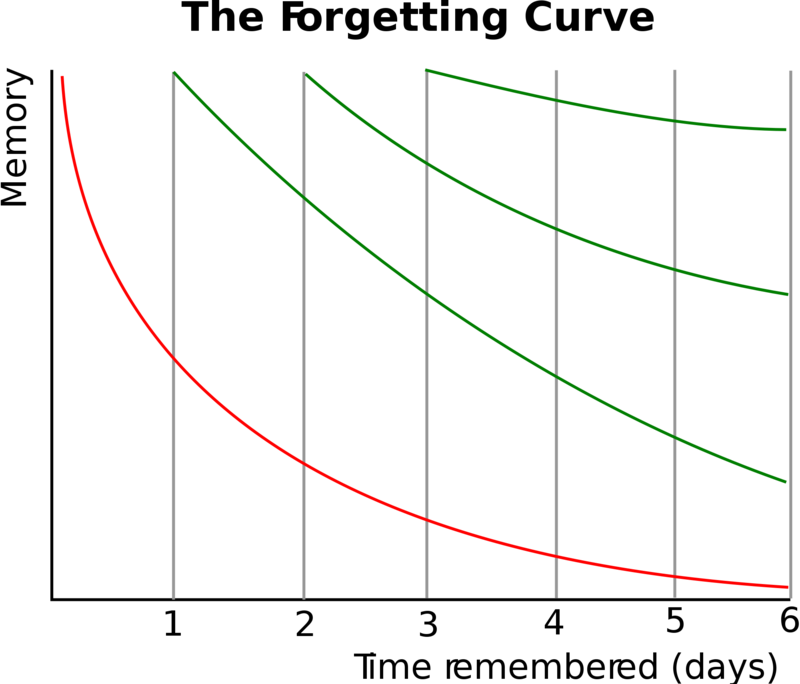 And because it is only attacking the material from one side of the forgetting curve and using an approximation rather than doing what Anki and Super Memo do in re-presenting material in an algorithm mapped onto the memory curve it will need you to look at the material on average only 3 times each piece. Typically those other systems need to show you the cards about 10 times per piece. They will get you to a long-term remembered vocabulary of the size you want in the shortest possible chronological time – so if you want to learn a language in the next three months (this idea became fashionable on YouTube recently) then your best bet is Supermemo or Anki, but if you take the actual hours of work you did and then use them on Goldlist method, you’ll see that the same number of hours spent will almost certainly result in a far larger fund of learned material using the Goldlist method. There is a handful of people who have now tried this by the way and confirmed it. Another interesting point is the way holiday works – in some companies there is a rule that two weeks of the Annual Leave must be take in one block. Obviously that’s not so common in the States as in the Land of the Free they ironically get given less free time than anyone else in the world and two weeks per year is about all they get. But in the EU it is not unusual for companies to send people off for a mandatory two week break because this is considered the way to “re-set” the minds of the staff. There are healing cycles in the body that last different lengths of time, one of the main ones is the 40 day cycle and there is also a one-week cycle and a three day cycle, depending on what you are recovering from, but the particular choice of two-weeks here probably is also linked to observations of effectiveness of break length, with many people coming back after the short-term memory has cleared feeling radically different to when they only took a one week or a ten day break. Posted on 10/05/2014, in Blog only and tagged 14 days, elephants, goldlist, goldlist method, long-term memory, Short-term memory, where does language come from?, Why fourteen days. Bookmark the permalink. 4 Comments. I think it was about time this got its own article. It’s something that often needs explanation. Wow, now that was an answer!